HIGH OUTPUT. SECURE ATTACHMENT. Powered by REDLITHIUM® USB, the Milwaukee® USB Rechargeable Hard Hat Headlamp delivers 475 lumens of TRUEVIEW™ High Definition output, and is capable of all-day runtime, over 2,000 recharges and 3X faster charging via USB. Optimized for use with hard hats, its slip resistant strap and clips provide easy and secure attachment. A water, dust and drop resistant body and lens allows it to withstand the toughest conditions. Get maximum control over output, beam coverage and runtime with five different modes, flood, spot and spot/flood beam patterns, and up to 31 hours of runtime. The REDLITHIUM® USB Battery can be recharged in the light via Micro USB or swapped out with additional REDLITHIUM® USB Batteries for virtually no downtime. The Milwaukee® USB Rechargeable Hard Hat Headlamp is covered by a limited lifetime warranty. Spot/Flood Mode: 475 Lumens- 2 Hrs. Flood High Mode: 300 Lumens- 4.5 Hrs. Flood Medium Mode: 150 Lumens- 8.5 Hrs. Flood Low Mode: 25 Lumens- 31 Hrs. Spot High Mode: 300 Lumens- 4 Hrs. 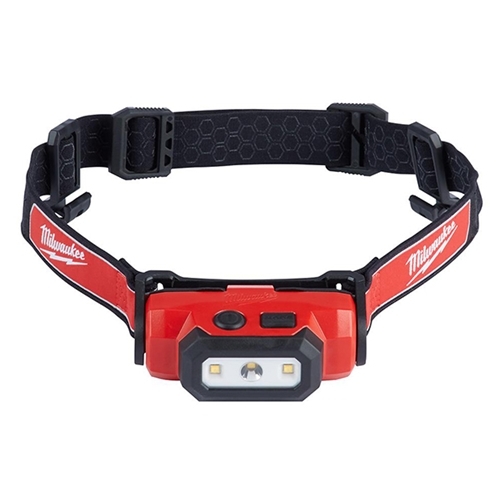 Milwaukee LED USB Rechargeable Hard Hat Headlamp has a rating of 5 stars based on 1 review.